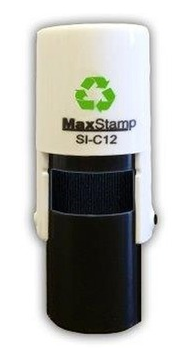 This is the very popular MaxStamp Self Inking Rubber Stamp. Q: How long will this last. about how many hands will it stamp and do you do a replacement ink and how much? Thanks for the question posted on our site. These stamps will stamp 100’s if not 1000’s but the manufacturers will not commit to an exact figure because there are so many factors that can alter the performance. I would always recommend ordering a spare ink pad just in case and they are only £3.84 so it’s always good to have a reserve. Q: Is the ink waterproof - and if not can I buy waterproof ink...? The ink that is supplied with these stamps is water based which can be used for hand stamps although this will be maybe a little small for that purpose. I wouldn't recommend permanent ink to use on skin as it's solvent based and could cause an allergic reaction or irritation. The ink pads supplied with these as standard are water based. You can then ink the pad manually and refresh it as often as needed. Q: Can you use different coloured ink pads in the same stamp? Yes you can. All you would need to do is swap the ink pad to a different coloured one and away you go. I would advise using a wet wipe to clean the rubber die just so you don't mix the colours apart from that it's very simple to do.